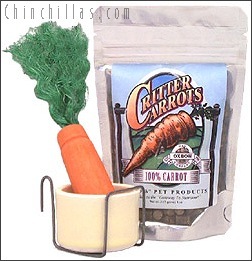 This auction is for a Ceramic Supplement / Treat Bowl, Carrot Chinchilla Toy, and Oxbow Critter Carrots. Retail Value $9.98 (Shipping not included). This off-white ceramic chinchilla cup hooks on the sides of wire cages, and helps prevent chinchillas from turning their feeders over. Feeding your treats or supplements in a separate feeder from your regular pellets is highly recommended, because it disuades chinchillas from "digging" through and wasting feed. The feeder is attractive enough for indoor use, and practical enough for breeders. This cup can also be used for water or in transport cages. The ceramic cup is very easy to remove from the bracket for cleaning. These life like toys are a favorite among chinchillas and their owners. Chinchillas love to toss and throw these around as well as chew on the sisal and wood. This perfect combination of high fiber and low protein make Critter Carrots, natures' perfect treat for healthy digestive systems.We have removed the sugar from the carrots to produce the healthiest treat available for your pet. Give your pet a few Critter Carrots per day for a taste they will love with the high quality nutrition that you have come to expect from Oxbow Pet Products. Note: All products are packaged by the manufacture to ensure quality and freshness. Visit the Chinchillas.com E-store to see more Oxbow products, and other chinchilla related items.